Building on our training before Christmas on the recovery position, today we have learnt how to give an unconscious person CPR. 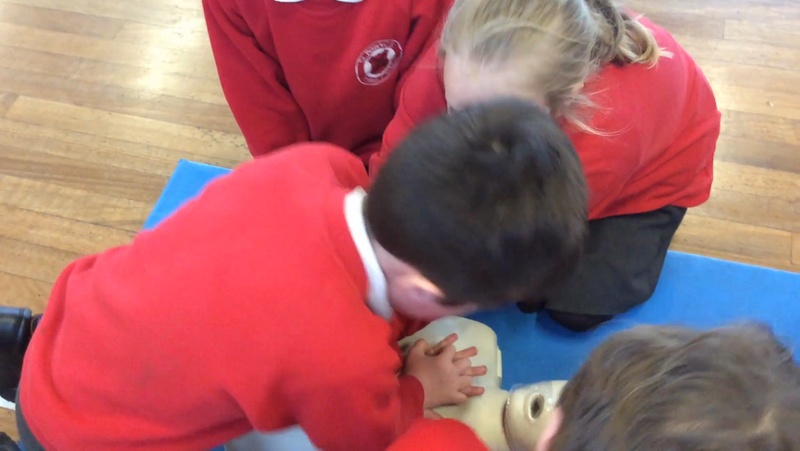 We watched to see how a defibulator can also save lives. We all tried to keep a steady beat and keep pressing onto the heart and worked in teams to keep up the treatment and then allow each of us a little rest before our turn again. Today we met our new sponsored puppy called Elsie. She was lovely. She met us all and gave us all a cuddle and we learnt how her training was going on. Dave and Sylvia told us lots of detail about guide dogs - did you know it takes 2 years to train a dog to become a working guide dog. FIRST AID FROM CHORLEY ANGELS. We learnt some basic first aid such as recovery position, checking for a pulse and advice on what we can do in an emergency. School Council elections are underway! We have written our manifestos and presented them to the class. Well done to pur 6 winners who will now begin campaigning. Our candidates distributed posters, stickers and even advertised on t-shirts in their bid to influence the vote. We used an authentic polling booth from Chorley council to cast our votes. The children understood that in a democracy it is the majority that control who wins - not individuals. Good luck to our 6 candidates. Moments of Inspiration. Shaun came into school to share his life story and how he has overcome his disability to achieve his ambitions. He truly was an inspiration to us all. We experienced what it was like to play basketball in a wheelchair and had a fantastic time! Shaun taught us that we are all unique and can overcome any challenge we want.